With our customized graphic printing, Canvas ETC. now offers stylish and high-quality professional displays and trade show tablecloths! With our broad range of trade show table cloth covers available in stretch, fitted or thrown, you’ll have every option you’ll need to step up your trade show booth. Anywhere you want to promote your business, our fully customized table cloth covers will ensure your company’s message is expertly conveyed. 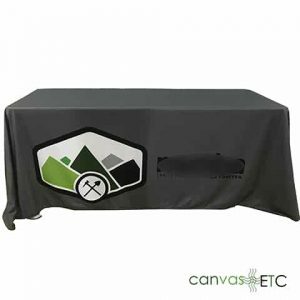 If you’re looking to separate your business from the competition, a great custom table cover certainly helps to improve presentation for businesses looking to promote brand awareness and product remembrance in prospective clientele’s minds. First of all, face-to-face marketing has long since become the best way to not only get to know your clientele, but to show them what your company is all about. With promotional items and marketing materials like a custom tablecloth, your branding shines and showcases your business in the best way. The idea of a trade show isn’t a new one. The very first large format trade show occurred in England back in the 1800’s. Merchants came from all corners of the earth to show just what their businesses had to offer. This led to shows becoming common all around the world! You could easily feature your business to many with the trade show booth format. They ushered in an interesting way for customers and vendors to mingle and meet about exciting goods and services. Trade show displays and materials like a printed table top, banner stands, table runners, fabric display stands and more with logo prints key information on your business helps your clientele associate a visual to your brand. When color table covers are vibrant and feature the best about your company, people remember it. Other great marketing materials are business cards, brochures, rack cards, and small promotional gifts like pens with your company logo. These items and your trade show tablecloth keep the clientele coming back for more. Setting up for a trade show event doesn’t have to be a difficult process. Knowing what’ll work within your assigned space helps the set up go smoothly. Having the right accessories makes your overall trade show experience simple and enjoyable. A great trade show accessory is a pipe and drape kit. Depending on your location, a venue may have already supplied something similar to this for your space. If not, a pipe and drape kit gives a sense of defined space while people are visiting a trade show booth. Another great trade show accessory is a banner. If you’ve secured your imprinted table cover, having a banner that has your company logo helps you stand out among the crowd. Banners come in various styles and colors, so you’re able to pick what will work best for your trade show setup. Portable counters work well for additional space to feature a product or service line. Your products will stand out on exhibit with the right counter space. Additionally, use a portable counter so your customers are warmly greeted with by member of your staff. All of these alternative trade show accessories are great additions to any trade show booth. With the right accessories like a trade show tablecloth and more, your business will be positively remembered for those who visit. Our selection of excellent trade show tablecloths boast wondrous features for all your needs. You won’t have to worry about if your table cover will hold up for an entire show. Most of all, at Canvas ETC, we ensure each tablecloth withstands whatever it’ll face when you’re exhibiting at a show. Hence, our trade show tablecloths come available in assorted colors. 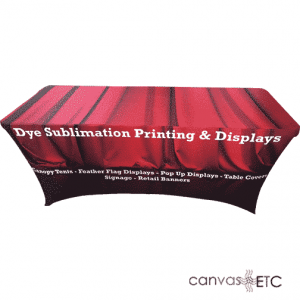 Likewise, they’re also dyeable, which means you can custom print any image on your trade show tablecloth. We pride ourselves in our printing process, so you will receive the most cost-effective option for the benefits. Certainly, our dye sublimation printing process (which infuses the dye into the fabric, not simply onto it) produces the highest resolution graphics in full color. Your logo or promotional artwork is accurately and exceptionally created with photographic quality in vivid shades and the exact colors to your tailored specifications. As a result, colored table covers pop with this style of dye work. After a long event or trade show where the table cloth has undergone the hustle and bustle, our trade show tablecloths are machine washable, so you can trust that the dye will never fade or peel. Both stretch spandex and traditional material tablecloths continue providing a professional appearance as they’re also wrinkle resistant. Best of all, if your event requires flame retardant material, these fabrics are additionally fire-safe and ensure event compliance. Maintaining crowd safety at any event (including a trade show) is key. Civic centers, convention halls and all sorts of venues have codes to adhere to in order to ensure the safety and enjoyment of their guests. These codes are typically set by municipalities and other governing agencies. We want to help ensure you’re up to the task when exhibiting at a trade show or corporate event. Our trade show table cloths are made from several different materials but are inherently flame retardant or treated to be flame resistant. We’ve studied the standards to ensure our fabrics meet them so that you needn’t worry. Flame retardancy in textiles or drapery follows the standards as set by the National Fire Protection Association, or NFPA. The NFPA creates standard operating procedural documentation for governing bodies to follow in their spaces. The guide for fire safety with textiles is commonly known as the NFPA 701 Standard Methods of Fire Tests for Flame Propagation of Textiles and Films. The NFPA classifies fabrics with various terms, such as non-flame retardant (NFR), inherently flame retardant (IFR), durably flame retardant (DFR) or just flame retardant (FR). Each classification means something different depending on the fabric. Fabrics that become treated chemically to become resistant to fire are FR, or flame retardant. Inherently flame retardant (IFR) fabrics like those utilized for our trade show tablecloths become flame resistant during the processing of the fabric. Therefore, this means that the fibers making the fabric already have flame resistance when they’re made, like polyester. Trade Shows: Show prospective customers what you’re all about with a table cover that’s unique to your company’s offerings. Banquets: Are you celebrating a milestone at work? Our trade show table cloths work great for corporate banquets too! Convention Halls: Get people excited about your event at a convention hall with a custom printed table cloth. Concerts: Your band’s merchandise table won’t be missed with the right table cover. Help your fans find you in the crowd. Non-Profit Organizations: Share the good your non-profit spreads with the right message on a one-of-a-kind table cloth. Job Fairs: Show prospective employees why they’ll want to work for you. A trade show table cover also works well by putting your company’s professional foot forward. Fundraisers: Raise money by drawing a crowd to your table. Being noticed has never been easier with this custom option! Military Recruitment Stations: Get recognized by possible recruits with a table cover with your branch’s logo. Library Book Days: Make reading fun with a catchy table cover that shows the facts! Farmer’s Markets: Make your table as unique as your grown goods. Your customers won’t forget their new favorite supplier with a great table cover. Hotel Events: Are you planning an event for a local business or organization? Get your tables ready to host with a custom table cloth. Add your logo for sponsorship credit at your next event! Retail Storefronts: Attract the right attention with a table cover that’s as showstopping as your products! Your customers will visit with the right table setup. Table space is prime real estate at any trade show or event floor. It’s the place where sellers and buyers convene and meet. A well-dressed table is the perfect point to give away promotional material, display merchandise, and have a new customer learn all about your company. Custom Printed: In single, multi-color or full color options. Unprinted: These would be simple, economical plain table throws designed to naturally cover tables. 3-sided or 4-sided Fitted: These provide customized table coverage, and even full coverage to simply conceal other material, supplies and equipment down below. Fitted Stretch Fabric: Customize on-the-go with this option and create your own fit tables and wrinkle-free exhibit. Thrown Table Covers: Plain and loose fitted table throws of a solid color with coverage for storage. Convertible: Variably sized tablecloths that’ll convert from smaller to larger depending on your table size. Table Runners: Single cloth as long as a table cover that runs lengthwise over a tablecloth to accent your table. Banquet Covers and Skirts: For events that celebrate many occasions from milestone birthdays to weddings. Step-up your trade show tablecloths and event display game with a table cover cloth from Canvas ETC. 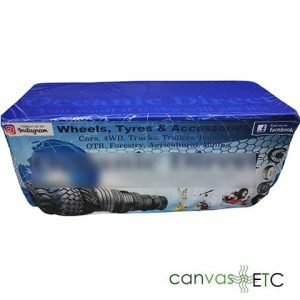 Canvas ETC is your forerunner in all things related to your next trade show event, including custom printed table coverings. Take the guesswork out of having to figure out all the different places to find your materials. Therefore, with graphic experts and so many styles, your table’s customization needs are met efficiently and carefully. Our trade show tablecloths come in many sizes depending on the table you’re using. With all of these amazing choices, it’s a no-brainer to purchase your next set of trade show table cloths from Canvas ETC.